I love the silk fusion that I showed you last week, but the fabric is still a bit flimsey for some uses, like heavy beading. One way to solve that problem is to add more layers of roving or to use a heavier-bodied polymer medium, but I don't like either idea. Extra layers of roving just wastes roving, although I know some folks use non-dyed roving for the middle layers that won't show. Still. And making the polymer medium heavier will not only spoil the feel of the fusion, it will also make it more difficult to stitch through. 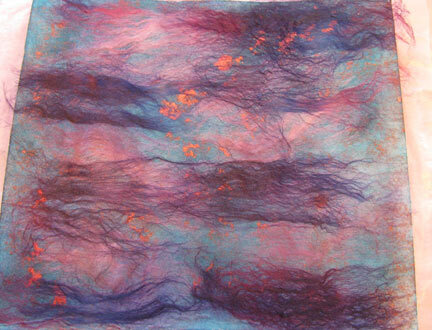 So, I thought about merging an aspect of needle felting with the process of making silk fusion. What about using a piece of lutradur as the bottom layer of the silk fusion? And even further, what about adding color to it? It worked great! Using the same technique as I showed you in part two, I simply layered the roving onto a piece of pre-painted lutradur (dried). I only wet the fiber sandwich from the top and used just a bit less GAC 100 polymer medium. The drying time was a little bit longer, but not much. 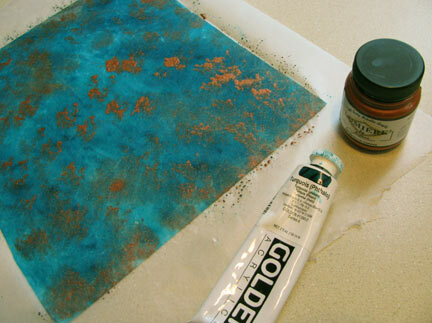 Before using the silk fusion, I ironed it with a warm iron as before. Be very careful...lutradur will melt if the heat is too high. That's gorgeous, Cyndi. Thanks for sharing a totally new technique. I've seen roving where the artist uses layers upon layers upon layers. It requires a lot of time-intensive needle felting (in the silk case also expensive) and doesn't do anything to enhance the colors. 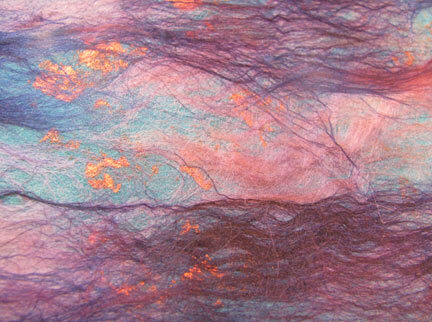 You Lutradur background really enhances the silk roving and makes it gleam.